Those two things are completely unrelated. Tonight, after spending the last two days digging out of the fourth snowiest February in Minnesota history (the snow banks at the end of the driveway are as tall as I am, even with two toppings by Eryn), we went to a Alita: Battle Angel premier. The Rosemount theater had a good deal for advance screening tickets and, combined with my gift card and rewards card, there weren't even any additional fees. Bargain. The movie itself was perfectly serviceable, but that speaks for itself. The focus was on the spectacle and it felt like the character interactions were a bit lacking because of it. I enjoyed it; very reminiscent of Ready Player One in design, but not nearly as good as that movie. 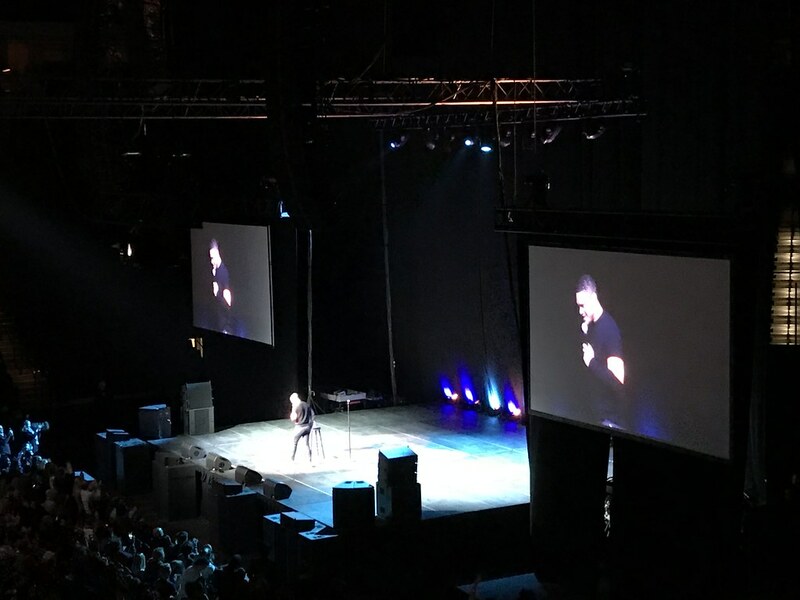 Last Saturday Eryn and I went to see Trevor Noah at the Xcel Center for his Loud and Clear Tour. I won tickets and parking from work. We tried to go to the Red Cow before hand, but it was too crowded, so we ended up at the Bohemian sausage place, which makes Eryn a bit nostalgic for the one in Eagan that quit paying their bills and skipped town. Ming and his family were at the show on the other side of the Xcel from us. We could barely see them when we squinted. Eryn loved the show and laughed a lot. She was somewhat annoyed with the first comedian whose bit was about things millennials didn't know about (but do), but she liked the second guy and his bit about his uncle and micro-airlines, and she loved Trevor Noah. He did some politics, but focused more on differences in men and women, branding (although that was political, and had a pretty varied set. Eryn was amused when he was talking about branding and asked all the men to put their hands up then said "put your hand down if you've stopped masturbating", and followed it up with the guys not wanting their wives/spouses to think they were quitters. We couldn't tell if Ming put his hand down.